This was done from a precut package I got at a recent blanket day - done in 3"x6" charm bricks. I just assembled, backed, and bound. I'm not fond of the bright orange, but some child will love it. Thanks for your comments and I will get it mailed to you this week. Do you like my clothes? Do you want them for....free?! I have finally finished this quilt. It's another of my 2008 Project Linus deliveries. Though I did start it with grand intentions of it looking like the one Lisa Boyer did, which is lovely, it turned out clearly being more of an I Spy Ugly quilt. 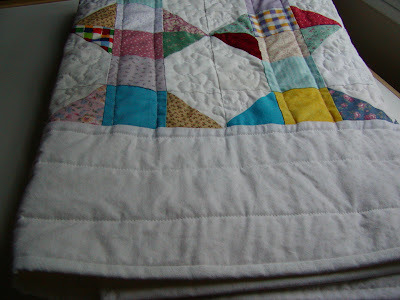 I mostly hand tied the quilt, with five rows of hand quilting for added reinforcement. It has the most robust and thickest poly batting I have ever seen (and hope to never see again I might add) so I think it will take a hurricane to make it come apart. 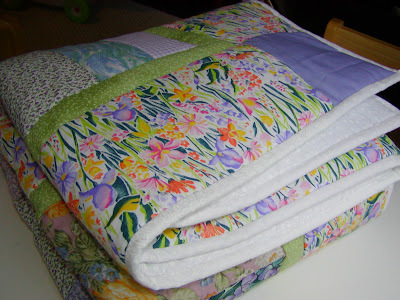 I hand sewed the binding last night as I was dreaming of my next 2 Linus quilts to be made with some of my very cute novelties. These will be fun! 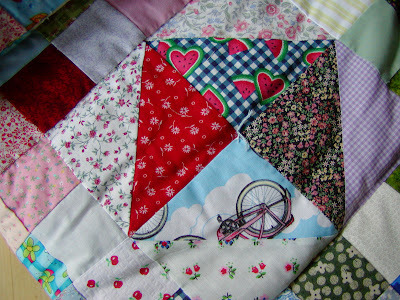 The quilt has everything from hearts to flowers to bicycles to jellyfish to gingham and batik to pine cones and polka dot. And...you guessed it, solids, stripes, metallics and butterflies. And that just all I chose to photograph. I think a young kid will get a kick out of the wild variety and the colors. That's my hope anyways! That is the title of the week. Making Mistakes! I hate to sew when all I do is use the seam ripper, or recut pieces because for some reason the block comes out too small. I am generally speaking something of a perfectionist, so substandard work gives me heartburn. Despite having many (many) pans in the fire right now, some of which I am desperately trying to complete, here's a glimpse at my July blocks for Kate's Birthday block swap. They are for 3 different people. 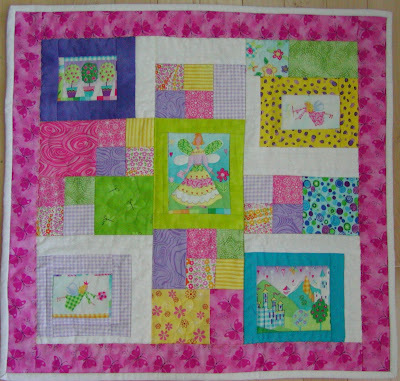 One of my group 3 quilters asked for a garden-esqe block in any color & size. So I used a lovely Monet rose print and did the picket fense. I hope it is not too simple, but I do like it. The other group 3 block is the blue & white star. She's making a quilt for a friend that lost everything in hurricane Katrina. Having lived 45 minutes from there as a kid, I was passionate about her cause, and very glad to see that her "birthday" is the first month of the swap. I did make a small "oops" on her block. See if you can tell...In the end, I thought that it still looked really good, so I decided it was just part of my design! My last block is for Group 4 (the advanced group) - the New York Beauty in ocean colored batiks. It took me forever to make (makes me IMMENSELY) glad that I will be receiving 11 of these come November:-) I think it looks pretty good; most of the points are clean. 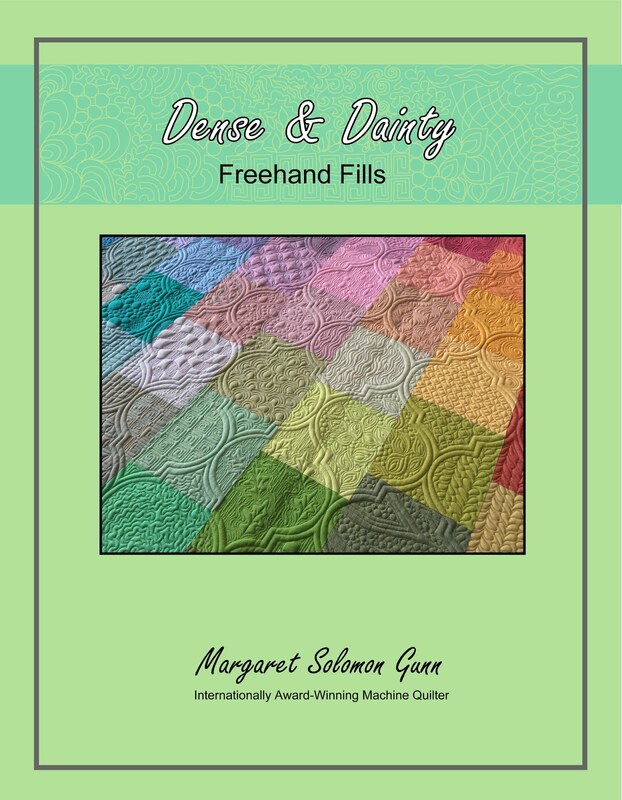 I have been battling the FMQ tension on my machine lately. It really makes me UGLY. I get the loops on the back side regardless of what I adjust. 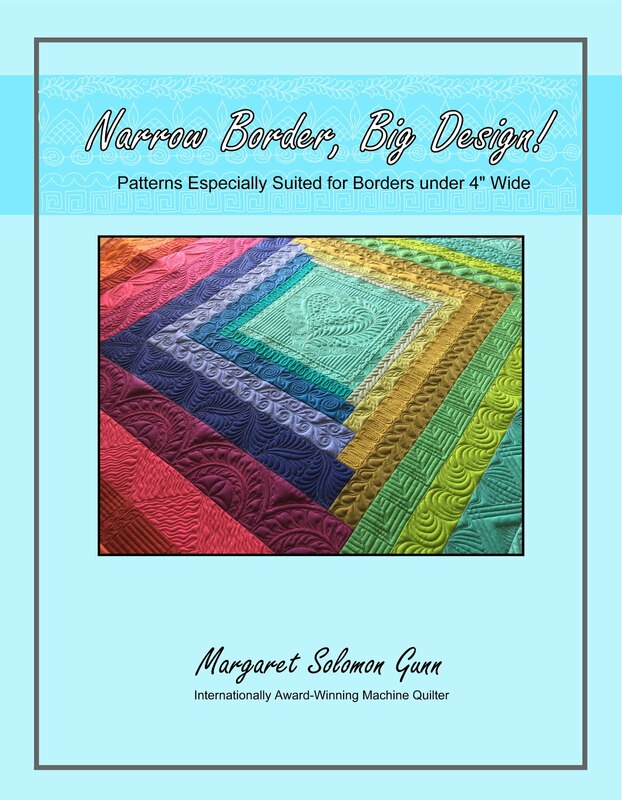 It makes using a different color top thread (or non-patterned back fabric) impossible. I seem to have it under control a bit this morning and have begun the quilting of my 4SQS top (yes, the second one!). It is very sweet, and remainiscent of the New England summers. I believe my partner will be craving a trip north soon! 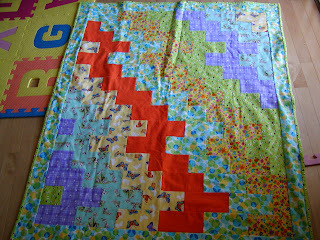 I need to finish a Linus quilt that has sat idle for a week or so (it's awaiting 2 rows of my hand quilting and a binding. That's been ignored as it is "boring" work! My daughter's dress is also in that perpetual state of "sew - n - rip". I keep thinking that it is a simple pattern (so why don't I actually read the directions! ), so there have been some mistakes. I will work on it this week more. - Need to put in a zipper in the dress I'm making for my soon-to-be 2 year old's upcoming birthday. Her dress is cut out and started. Not a fancy smocked number this year, but something cute and colorful. Turning two should be fun. 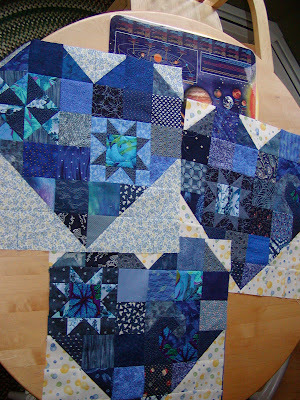 - I have already made my July Partner Diane's blue & white star block for the Forum Birthday Block swap. - I have my Booty swap partner now so I can brainstorm on that mini soon too. I have completed my summer quilt. I couldn't be happier. I just love the way it depicts MY Summer. This is what Summer in Maine is all about (minus the black flies and humidity). Oh, and the white beaches too. Our sand is much courser and darker at most beaches. Anyhow, the feeling is here. Most beaches will have a lighthouse within sight. Our coast line is unforgiving to the boats. It is beautiful and rocky in most places. The light houses save many a lost boat, as going into the main surf is an almost certain death as cold as the water is much of the year. Half-standing plank fenses litter the beaches. They are truly picturesque additions to what Mother Nature gave us. Lobstering is one of our largest industries, especially in the summer. The fense would be incomplete without some of these. Each lobsterman (or woman) has a registered stripe pattern so that they know whose traps are whose in the ocean. Here is how I cured my previous problem with the background fabric showing through the white of the chair. I think it works well. 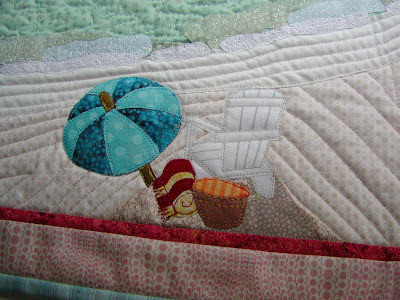 All in all, I am tickled with this summer quilt. It turned into way more than I had anticipated. When I started, I was trying to depict another place (which I cannot say, or my partner will possibly know this is for her). But in the end, it turned out looking like MY home. Consequently, I have dedided that this will stay in MY home. Sigh... So I am back to the drawing board, so to speak. 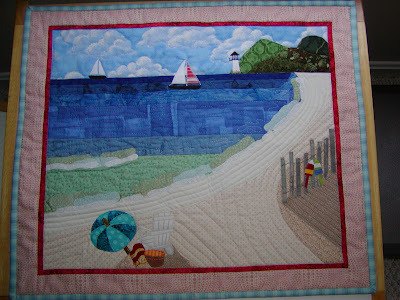 I have decided to make my 4SQS partner a similar quilt with "scenes" from the beach rather than an entire beach landscape. My four scene panels are complete and look good. I will post about this at another time though. This wild little number arrived this week from Kate. It's her ALQS mini for ME! Wild it is, but I have a secretly kept wild side (hence the Frog in the Blender, which was mailed over an ocean this week). It looks a bit juxtiposed hanging in my very traditional dining room, on this hideously country (he he, country is NOT my thing) hanger I have previously had another quilt on. But my dining room and other downstairs rooms have deep purple and cranberry in the window coverings, furniture and paint, so it does blend in nicely. The back fabric is radically cool, I must say. This has a metallic printing and is actually one piece of fabric. Many thanks Kate. I do like it. It took a few days to post this as my batteries died and the price of gas here has kept me home until I needed other items. Next, I mailed this off to my Forum Doll Quilt Partner, organized by Ginger, on Tuesday. It's done with 1930's style happy prints and polka dota. It ought to be received in the mail today, so I will post it this morning. I hope my partner appreciates it, as I will be seing what she makes in Kate's Forum birthday block swap soon too. Here's a shot of the back. It's like a flower. My two neices, ages 4 and 6, moved to Italy in January. We had been very close to them prior to then, visiting many times a year. It's been a difficult transition for my older two kids, not getting to see them, and hearing that my mom is going there to visit next week. Sadly, at the tune of $1400 per ticket (and then we still need passports), we are not going to be visiting any time soon. That, afterall, is a huge chunk of my future kitchen-living room remodel. 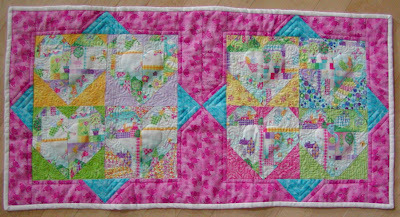 And I fortunately had this pieced and quilted from another swap (partner opted to bail on the swap so I didn't have to mail it). Sorry, Rachel, it's not horses as I know you love most, but it does have some symbolism. Or it did when it was conceived. It was made for someone that had 2 girls, hence the two angels and two hearts. Luckily, it's way more appropriate for Rachel and Alyssa, as we really do love them. We may not see you right now, but angels watch over you, and you are in out hearts. Then about 10 days ago my SIL said she'd like me to send along my remaining pieces of Alyssa's fabric to make her a dresser scarf. DOH! 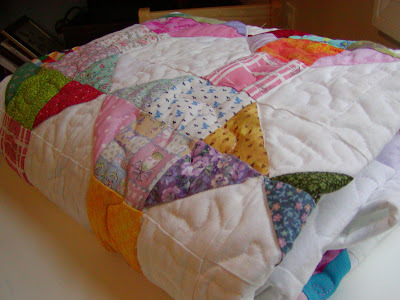 What scraps, I thought to myself!...I had just used most of them to do her mini quilt! After speaking to her last weekend, and getting the size dimensions she was looking for, I threw this together. Haven't done much other quilting in 3 days. It should have been simpler and would have been if I'd had bigger pieces. It's made up of eight little hearts, one for each of us here in Maine. You can think of that, Alyssa, when you see them. That theory works at least until another of our cats croaks (which if Tiny Sally jumps to the balcony AGAIN, may be sooner than later!). I put an extra piece of batting in the shape of a heart (basted it in) to make the puffy hearts. It's just something I'd been wanting to try. 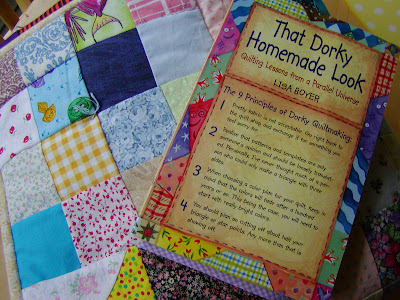 Seems with every little quilty project, I have been trying to work in my agenda for little tasks to practice. I was more scared of trying the "McTavishing", or should I call it "McMargaretting", but it really looks pretty nice. Or not too horrible anyhow. I wish I could say the same for these loops...I got the whole darn border quilted before I realized the thread tension had gone totally whacky. Spent 2 hours in front of the telly picking it out last night! 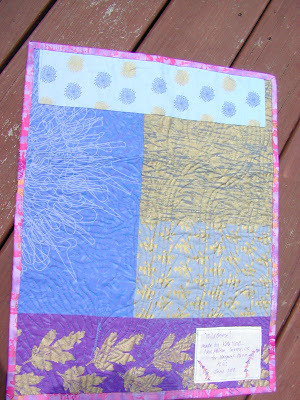 - mail Ginger's swap piece to xyz quilter in somewhere, USA!! I was so elated I nearly kissed my postal carrier when I saw there was a package going into my mailbox. Well I came to my senses quickly. 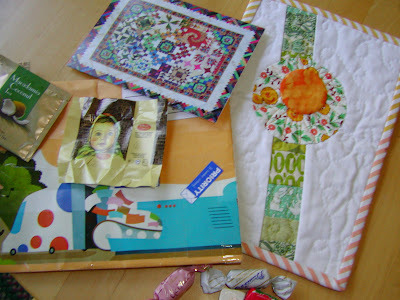 But I was pretty darn excited (thinking it might just be that long lost DQS quilt that appears to be destined to stay lost), and even more so when I saw that the package had a return address from Finland. Finland meant one thing...Jen. Not only that, it took 3 days to get here. I'll take more Finnish mail, thank you!! I had to chuckle BIG though when I saw what Jen taped onto the package. It's a cartoon of a paper machine! Ha... she is a fellow Mainer, like myself, but lives in Finland where the pulp & paper business is like Life itself (once upon a day, it was like that here too). Anyhow, before my last 2 kids were born, I worled for Metso Paper designing, manufacturing and installing paper machine dryers - sort of a Queen of TP, I guess. I did that for nearly 10 years. My former employer, Metso, is a big name paper machine supplier in Finland. Small world. Thanks Jen, the quilt is fantastic. Your humor is a close 2nd. And my boys are trying to behave so as to earn a chocolate, but I think I will out eat their good behavior! And for the ALQS gem, looks like it's enroute to another lucky lady! With barely more than a week left before my son's year of kindergarten ends, we had a potluck dinner hosted by his teacher. 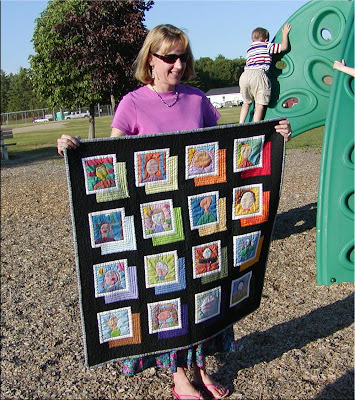 We took this opportunity to give her the quilt I made with artwork by all of her students. 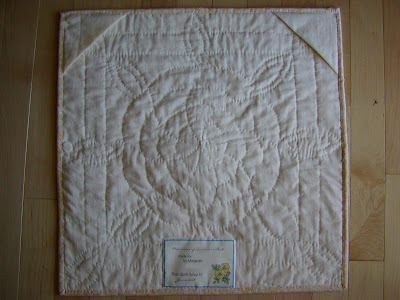 She was very touched by the card (printed below) and the quilt. It seemed that many of the children were equally as interested in what was done with the picture that they had drawn for me. It was a nice and somewhat bittersweet time. May you always remember us, as we will undoubtedly remember you. You're kind & patient, energetic & inspirational, creative & compassionate. Through your example, we learned so much more than our ABC's and how to count to 100. We learned to get along and to love one another. You have kindled our imaginations for years of future learning. You were our first teacher, and for that fact alone, you will forever be etched in our memories. Thanks for the many great things you have brought into our lives this year. Thanks to all for the great comments and suggestions about what to do about my beach chair. In the end, I have added a towel and beach bag to cover up the place where the background showed through. 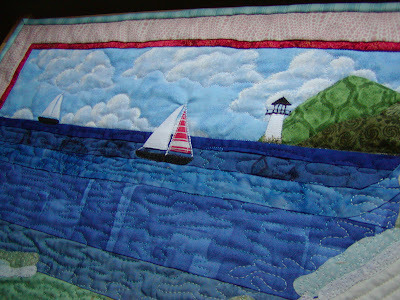 I also got my mojo this morning and have added some other goodies to the scene - a light house and two sailboats. It is looking most quaint right now. I am going to do my best to hold off on pictures for a while so that suspense can build (he he). I am currently auditioning borders. This does not typically frustrate me so much, but I want the piece not to drown in blues, but also want it to look summery & beachy. 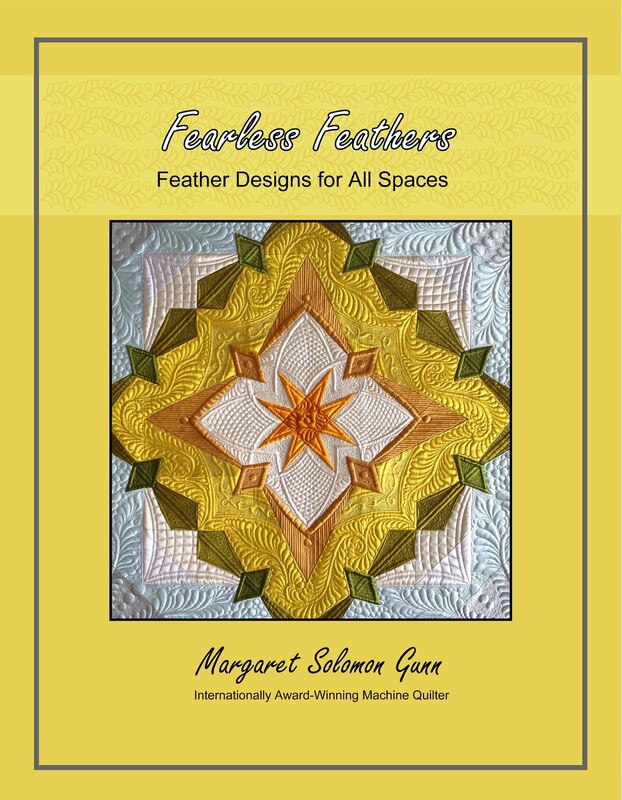 I should have it ready for machine quilting by early next week. I have a couple more things I plan to add to the beach scene, but you'll have to just guess what they are for now. I finished off the binding on my 3rd Project Linus top (for the week). This sadly only makes five for the year, but it is a great start to clearing out my finished flimsies. I currently have two more tops unsandwiched, one that is nearly ready for the binding (I tied it yesterday and am adding a little hand quilting for added reinforcement). I also pieced a package of flannel 3" x 6" bricks together into a top over the weekend. I picked them up at a recent Linus blanket event that I went to. I have officially used all of the nasty poly bat that I had in my sewing stash (YEA!!). 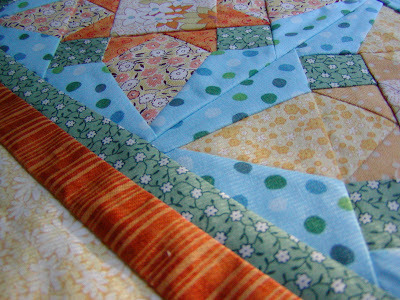 My quilt for Ginger's swap is coming along. I have one more evening of hand quilting and it will be ready for a binding & label. It's due out by the end of the month. 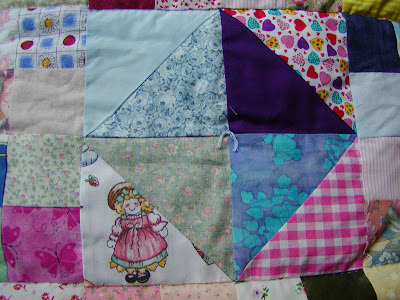 I have also signed on for Toni's Miniature Booty swap again (yea...remind me why I need to make another quilt??! ). It looks like there's a great bunch of ladies signed up. I am also making a couple of little goodies for my nieces. My mom is flying to visit them in 12 days. In January, they moved to Italy. I need to get another couple of my heart blocks done too this week. In the words of one of my favorite old songs... I may be past the point of no return on this mini. 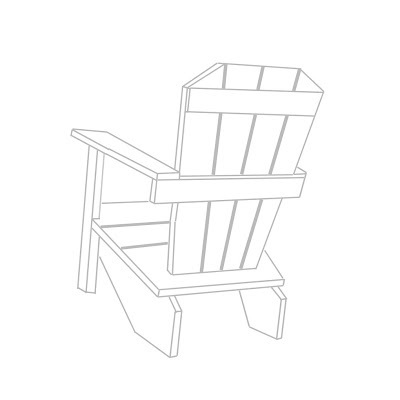 I was so delighted with myself that I sketched out a good adirondak chair in my Scrapbooking software, that I didn't completely think through the application of said chair. UGGH. I knew when I fused down the chair, that I didn't have much I could do if it didn't come out right. Now I need your help! I really need better lighting. I just noticed the damn yellow pen I used for marking. Permanent of course. That I may be able to cut off. But what is bothering me is that I can see the dark brown that is supposed to be a shadow showing underneath the white of the chair. Options...1) Pull up chair completely and carefully snip brown so there isn't any under it (I still worry that the other backgrounds will show thru too), 2) hand color the chair a color with permanent fabric pens (and if so, what color?? ), 3) Ditch it, 4) ignore it and hope my partner is more tollerant than I am? Admittedly, I have been lax this year at actually finishing my Linus quilts. Only 2 had been actually completed, compared to 24 this time last year. I have made several scrappy tops, but I decided it was good to get some of the tops actually turned into quilts rather than start anything new. This week I have completed 2 of them, and have a 3rd awaiting it's binding. 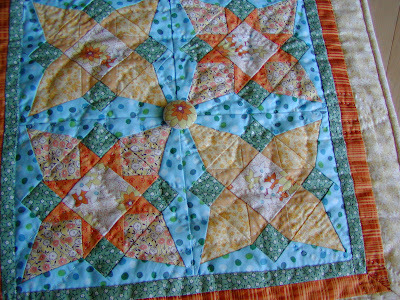 They are simple, scrappy colors pieced with white-on-white that was repurposed from my son's nursery curtains. 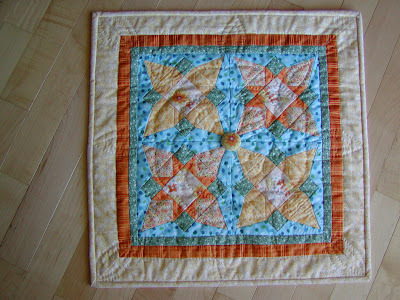 The first quilt (below) was my first attempt at machine quilting ever. I was not completely thrilled with how it turned out, but that I largely blame on the heavy polyester batting used. I asked my mom to pick up batting at Mardens last year, and didn't realize that this is what they had (60" wide for a mere $1 a yard.) Now I feel compelled to finish using what I have. 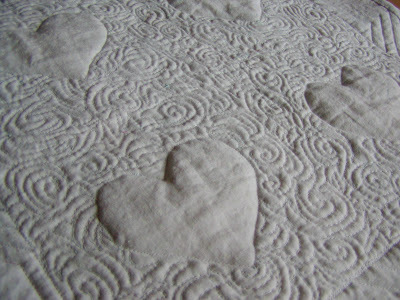 It is a little hard to machine quilt due to it's thickness, but it's robust! 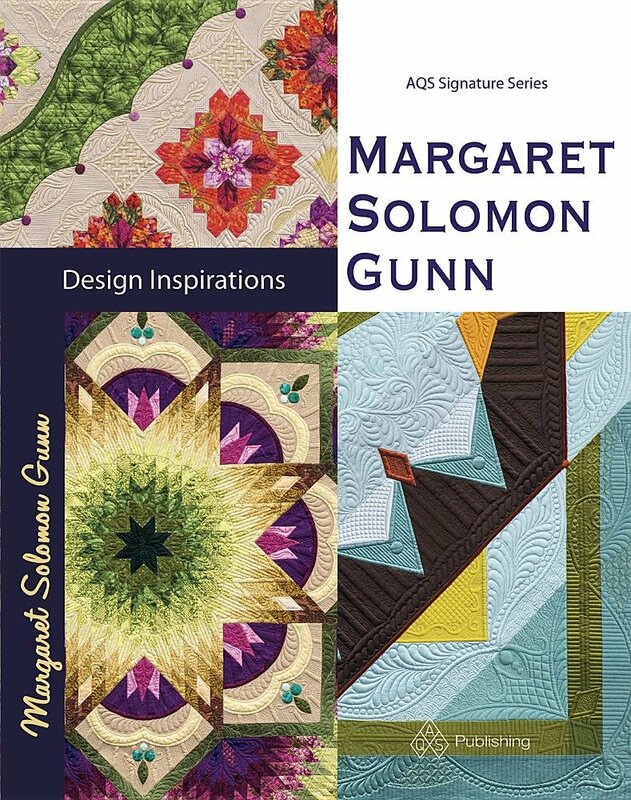 Two of the quilts are a scrappy spools pattern with the spools turned in the same direction rather than alternating, as the pattern is often done. They're about 42" square with borders. The picture below shows the full (unfinished top before borders). 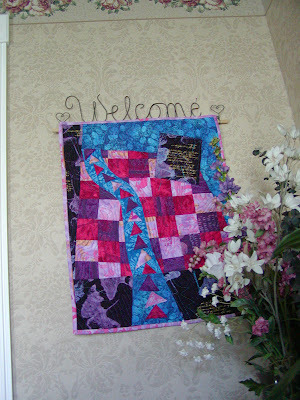 This one I did machine quilting on this morning. My other one is all done from floral scraps done in strips. It's about 40"x60". It's shown here... It turned out lovely for a little girl I think. 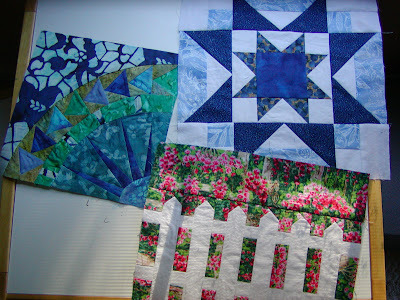 My goal is to complete the 3rd one I have started this weekend, and get another top ready to machine quilt next week. I have at least one top nearly completed that I can think of, and some squares for another too in some stage of completion. I need some advice or suggesitons. 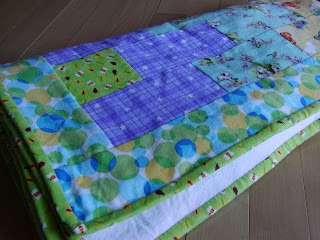 I plan to make a quilt for my Linus chapter's Book-Blanket challenge this fall. I need a suggestion for a children's book that might be good to use. 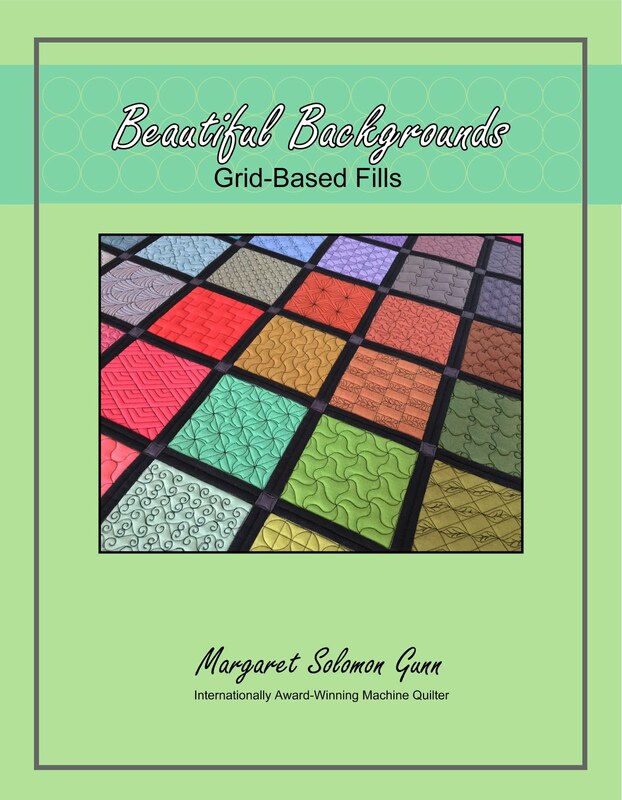 A quilt must be designed around this book. Last year I did the Hungry Caterpillar and actually won. I want something perhaps for a slightly older child - age 4-8. Leave me your ideas please!! I have come across these on several blogs lately. It's kind of fun and rather unexpected. 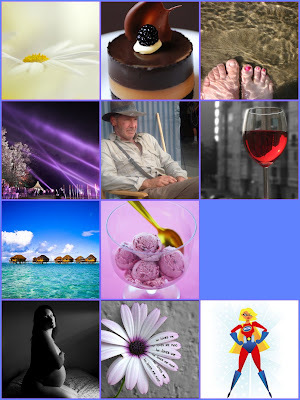 Can you guess the questions (& answers from the pictures) without going to the link??! Leave me a note if you do this, so I can check out your mosaic, too! Here are 18" heart blocks #7, 8 and 9 to go along with the first six already finished. Only three more to do (I think!). I got another package of more pretty scrap blues late last week from Solidia. Many thanks - they will be put to good use! 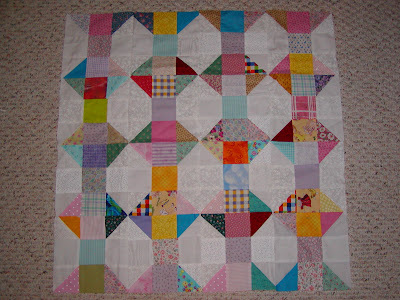 Once I get the last three finished, I will add the scrappy yellow borders to the blocks. At that point I will need to rethink the design a little, as I'm not sure what will happen on the part of the quilt that drops down on the sides of the mattress. The hearts are only on the top of the bed. I have a couple of nice asian-ish blue prints in decent yardage that may encompass a wide border though. 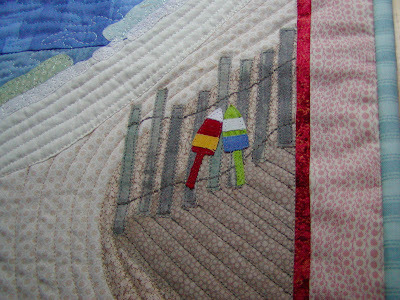 ~I am hand quilting my piece shown in the last posting for Ginger's swap. It turned out cute, but the blocks have a lot of bias and I hope that there will be enough to hold them smooth. At this point I waffle between continuing and believing all will look fine and ripping out the quilting threads and rebasting the top. Neither option leave me feeling 100% confident! ~I am gearing up for Kate's About.com birthday block swap which is set to start in a couple weeks. I have signed up for 2 groups which means I have to make 3 blocks a month. I am trying to clear several of the other projects I have so I can jump right into that. In the advanced group, I will be receiving a dozen 8" New York Beauty blocks. Maybe I will also make a few. They will be in purple, red and orange batiks. 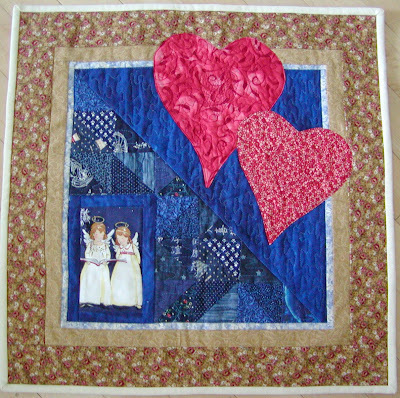 In the other group, I will receive 24 of the Broken Heart blocks (from http://www.quilterscache.com/) in 1930's prints. I am excited to see what blocks the others will be requesting that I will have to make. I just wonder how long I will have to wait until it is "my birthday"?? ~Thelast stages of the Spring Fling Round Robin are winding down. 6-8 of the 24 quilts have been finished & mailed. They are so lovely - go have a look (though most of my readers are probably in that swap!). 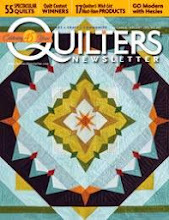 This is such a tremendously talented group of quilters and it has been a fun honor to work with them. 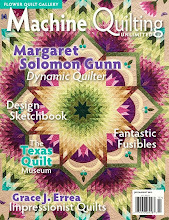 I will undoubtedly run another round robin once all quilts are at their end-destinations. Look for a posting sometime next month. This has been a sticking point with me lately, as I learned that one of the other popular swaps started up another session recently with over 15% of their members STILL not having a quilt in their hand. I just don't think that is a very courteous way to run a swap. 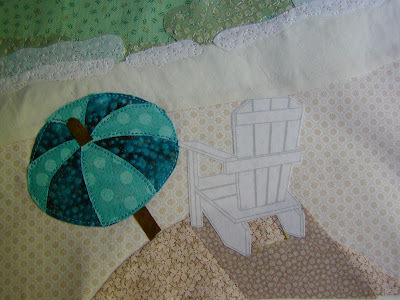 ~I will get back to my 4SQS beach quilt very soon. I've been busy designing this with my scrapbook software so I can add it (somehow!). A great big thanks to Ginger , who allowed me into her swap at About.com a day late (I was apparently too dense to notice I'd sent my information the day it actually closed!). Anyhow, I spent a few days this week futzing with some really neat kaleidoscope hexagons I made a month or 2 ago, thinking I'd use these to finish off my partner's quilt. I made 18 paper-pieced diamonds & triangles to help finish the piece. And then it hit me as I started putting it all together. I HATE WORKING WITH SET IN SEAMS! It's not that I don't know how. It's that I hate doing it! So I rationalized that maybe I'd like that quilt better than my partner, stashed it into a bag, and went off to find concept/design #2. I have some information about my partner's likes and preferences, but I'm not divulging that for fear of revealing her identity! I have pulled out several sunny and summery 1930's prints and searched Quilterscache.com for a great 1930's pattern. The one I chose is called dogtooth violet. It took about 5-6 hours to make 4 of those blocks. 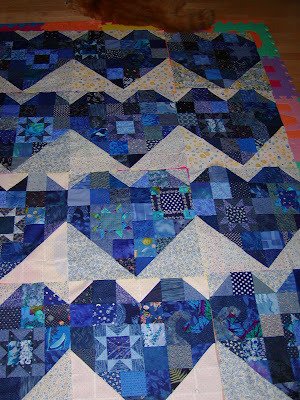 They are partially pieced, and partially foundation pieced. BTW...does anyone have a cure for excessive fabric waste while paper piecing?? I did the block corners using foundation piecing. It took nearly a quarter of a yard! Anyhow, in my usual weekend early morning peace (as the entire house is still asleep at 6am! 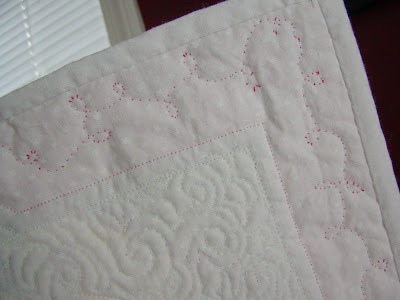 ), I hand mitered the corners of the border to complete the top. 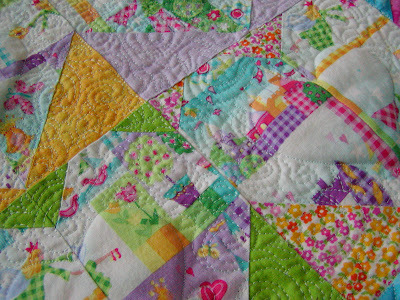 I plan to hand quilt this one so that it has a more vintage look. Nothing says well-finished & old-fashioned (as all 1930's pieces would be) than miters & hand work! 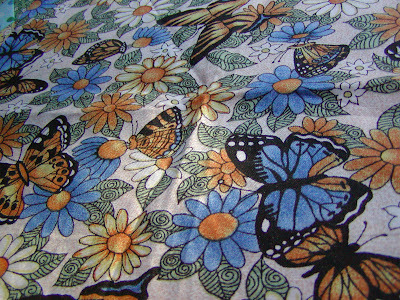 I also have this sweet butterfly fabric that Maria sent me with my winter 4SQS quilt which may get used on the border too. Well, today is my middle kiddo's 4th birthday so I must go get my self into gear and figure out what needs to be done to repair his cake (Why, oh why did we think it was OK to let his father make the cake this year???! ).